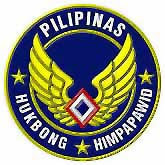 The logo of the Philippine Air Force and the participants to the first-ever training on disaster and rescue operations conducted in Davao City in Mindanao by the Philippine Air Force’s 7th Reservist Command in coordination with the Office of the Civil Defense Disaster Team, 911 Medical Team, 911 Search and Rescue Team, Philippine Air Force 505th Search and Rescue. (Mindanao Examiner Photo / Mark Navales). 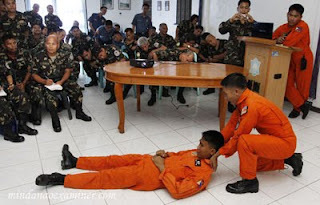 DAVAO CITY, Philippines (Mindanao Examiner / October 23, 2009) – The Philippine Air Force’s 7th Reservist Command ended Friday a four-day training on disaster and rescue operations in Mindanao. 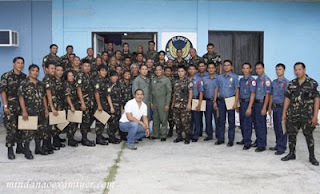 Major Adolfo dela Torre, chief of the 7th Reservist Command, said some 50 active air force members and reservists have participated in the training which began on Tuesday in Davao City. 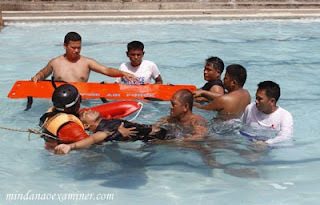 “We are overwhelmed by the number of those who participated in the first-ever disaster and rescue operations training and we hope to duplicate this in other areas in Mindanao,” dela Torre said. The training, which was also participated by policemen and village officials, was held in Sasa village. 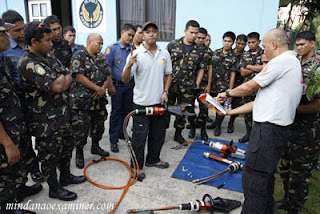 “The training included land and sea rescue operations,” dela Torre said.